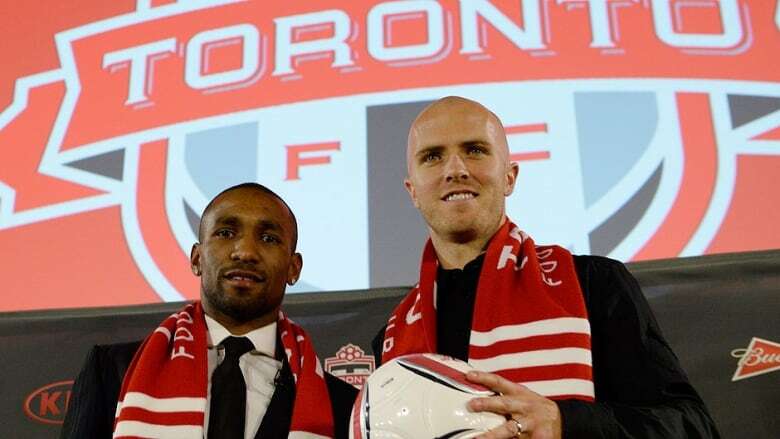 Toronto FC on Monday unveiled England striker Jermain Defoe and U.S. international midfielder Michael Bradley in hopes of snapping their seven-year playoff drought. MLSE boss Tim Leiweke wasted little time Monday reminding everyone that despite the star power about to join him at the podium, Toronto FC had yet to win anything. He also acknowledged that the unprecedented spending spree on marquee players Jermain Defoe and Michael Bradley, on top of Gilberto's signing last month, is being seen as fiscal insanity in some quarters. "I'd say some of our partners think we've lost our minds," said Leiweke, president and CEO of Maple Leaf Sports & Entertainment. It's like telling your accountant you want to buy three Bentleys at once. And that's before you add high seven-figure annual salaries and Gilberto's package. Under Major League Soccer rules, the sky's the limit with DP salaries — only $390,000 US of a DP's annual pay count against a team's $3.1-million US salary cap this season. "To do one DP is a smart move, to do two DPs is not the smartest thing we've ever done and to do three is financial suicide," Leiweke told a raucous news conference Monday announcing the signing of Defoe and Bradley. "We don't have enough seats to make economic sense out of this," he added later. "Today is why not," Leiweke added. "Why can't we be great?" Defoe, who will stay at London's Tottenham until the end of next month, was clearly moved by the warm welcome. "To come here and to have a reception like that is unbelievable. Such a great feeling, I feel at home already," he said. And why not. A double-decker bus with the Toronto FC logo and the words "It's a Bloody Big Deal" was parked outside. Defoe — a slender five foot seven sheathed in a smart suit and tie — said all the right things, explaining he was here "to win trophies and do my best for the club and the team." "I can tell you all I have never been more excited, more determined and more motivated for any challenge in my entire career," he said. The families for both players watched from the front row with Bradley's infant son Luca, wearing a Toronto FC jersey, gurgling in his mother's arms. Leiweke, who called the signings a "payback" to the fans for seven years of patience, sees Season 1 of the new Toronto FC as a loss-leader. It will take a year or two to get to the point "where it makes financial sense," he added. A revamped, renovated BMO Field is part of the MLSE vision "to take soccer to the next level." "Our owners gave us the ability to say 'What could we do?" Leiweke said. "We're going to be the first $50-million gross-revenue club in the history of soccer in North America, going all the way to the Cosmos. Our owners believe in that, we believe in that. "If people saw what we saw in the potential of this marketplace, they'd understand why we're doing it. But there are a lot of people that don't understand, I'm OK with that. "I also understand our organization now has a target on its back. People will say we spent too much. I spent the weekend reading a wonderful article from across the pond that ripped us a new one and said that guys like Jermain were coming here to retire. "We'll show them. And I hope there's a few more of those articles. We're going to post them up on the board here and in the locker-room and I think it will drive all of us." The MLSE boss called the acquisition of the 31-year-old Defoe, 26-year-old Bradley and 24-year-old Gilberto "a very very dramatic statement" in how MLS is perceived. Leiweke, who use to ride shotgun on the Anschutz Entertainment Group, has a sense of the dramatic. He is a businessman, entrepreneur, carnival barker and salesman rolled into one larger-than-life package. Look up smartest man in the room in the dictionary and his may be one of the photos accompanying the blurb. Should TFC hoist a trophy down the line, expect a major-league "I told you so" from the big man. But he knows that a team that has been the MLS doormat for its seven-year existence — TFC sports a 51-105-66 career league record and has never made the post-season — needed a life-sustaining jolt. The franchise was withering on the vine. The average TV audience for Toronto FC on TSN was 98,000 in 2013, down from 103,000 in 2012. On TSN2, the average was 27,000, down from 28,000 the previous year. Over at Sportsnet, the TFC average viewership was 35,000, a 29 per cent decrease from the 2012 average audience of 50,000. At 18,131, Toronto's average attendance was 10th in the league in 2013. Season tickets, once capped with a waiting list, were down to 14,600. But the team, under first-year manager Ryan Nelsen, shed bloated contracts and started to collect young talent en route to a 6-17-11 season in 2013. Signing marquee talent, particularly on offence, was the major off-season goal. The franchise has got its men, despite its spotty past. As Nelsen noted recently, players tend to look to the future and not the past. Bradley proved that, saying he was drawn by the team's ambition, drive and determination to win. "As a player, you want to be a part of something special like that." While the financial packages for Defoe and Bradley may raise the bar in MLS, Leiweke was quick to note that they do not elsewhere. "But we have our work cut out here to make economic sense out of this and we think we will," he added. Included in the transactions are a business relationship with Tottenham and player development deal with Roma. Both European teams will play exhibition games with Toronto as part of the deals. Across the hall, Bradley's No. 4 and Defoe's No. 18 jerseys were displayed prominently at an MLSE-owned sporting goods store. Leiweke said recruiting Defoe took some six months. Bradley came on much later. "We had to go quick," Leiweke said. "Michael had other offers. The club [Roma] had other offers. I know everyone thinks that we threw way too much money at it. The reality is they were going to get that transfer fee. "And so we did strike quickly, to the credit of our owners. It took a half hour for them to say get it done." GM Tim Bezbatchenko had Bradley on the top of his shopping list, but thought it was a romance that would not pay off for some years down the line. A good working relationship with Bradley's agent paid dividends, allowing Toronto to be "first in line" when the American decided he was interested in coming back home. Toronto will have to figure out what to do Argentine midfielder Matias Laba, who brings the number of designated players to four — one over the limit. It has until March to sort that out and with Bezbatchenko a former league insider, they will know all the options available to him. Bottom line, Leiweke and Toronto FC are rolling the dice and looking for a winner. The Blue Jays did the same last year, with minimal return on their investment. The cost of running an MLS franchise still pales when compared to baseball or hockey. But the soccer stakes are dramatically higher in Toronto now. Asked to compare the club payroll from this season to last season, Leiweke said: "It increased" and laughed. Asked to elaborate, he added: "Sure, it increased a lot." And laughed again. Reed: Will Defoe, Bradley mean more Toronto FC wins?